Do you ever want to say, “would someone just Do my laundry PLEASE!! !” Whether you want your laundry done Aberdeen or in any other surrounding town, the value in the time saved by having someone else do your laundry is a gift. It’s an appreciated luxury you’ll want to keep getting forever. So much time, energy and frustration can be saved by having someone else sorting clothes, filling that washing machine, dryer and finally, the dreaded folding. Folding laundry is a chore dreaded by many. Can Buying Laundry Services Make You Happier? An experiment was conducted where 60 people were instructed to spend $40 one weekend on a material possession and on another weekend spend $40 on a time-saving purchase, like laundry services. The participants were happier following the time-saving purchase weekend than after the material possession purchase weekend. The increased happiness was from the pressure that was released from not having the regular chore at the end of a day. If you want to read more about this idea read this Time Magazine article. At Pantorium Cleaners, we’ll help make you happier by doing your laundry for you. Your happiness is as valuable to us as providing excellent quality service and keeping your laundry in as good as or better condition than we received it. Call or stop by Pantorium Cleaners today to learn more about weekly laundry services, one-time laundry services or if you’re thinking of others, gifting laundry services in Aberdeen to a loved one or a friend. Conceptually it’s easy. Contact Pantorium Cleaners and say, can you Do My Laundry Please. 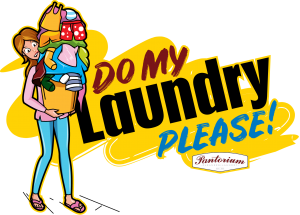 The friendly Pantorium staff will provide you with your choice of laundry bags, an Xlarge or large bag to fill with dirty laundry. The bag(s) are then returned back to store to have the laundry cleaned. If you live in Aberdeen you can arrange for the dirty laundry to be picked up and delivered right back to your home, making things even easier. The cost of the laundry services varies depending on the amount of laundry. The Xlarge laundry bag is approximately 40 gallon in size. To give you perspective, we had a 165 lb person climb in to see if they could fit and they did so with room to spare. The introductory prices for the Xlarge bag of laundry cleaned and folded will run $25 and a large bag can be done for only $19. So, if you’d like to buy your family or another family a months worth of laundry service as a gift, you’d be spending around $100. Remember, simply saying Pantorium, Do My Laundry Please can buy a good chunk of happiness and save you time to do something you really want to do. If you’ve inadvertently added dry clean only laundry to your dirty laundry bag, the Pantorium team will contact you for direction. If you’d like it cleaned, it will be at an additional dry clean only charge and cannot be included with your regular laundry bag cost. Learn more about Pantoriums laundry service for yourself or as a gift for someone you care about! If you'd like to receive a birthday coupon from Pantorium add your date here. Tell me more on how Pantorium can Do My Laundry Please! Stains and dirt won't wait. Why should you? Pantorium Cleaners is designed for your busy lifestyle. In our effort to make every day just a little brighter, we're ready to serve around the clock with little conveniences you're going to love and friendly service you deserve. Our Fluff and Fold service allows you more time with your family and other responsibilities while we do your laundry and have it ready for pick-up or we'll even deliver. Also, check out our coupons for other services to help you save money.